Before I start I want to say, I’m eating a peach and it is SO GOOD. Almost as good as chocolate… yes, only almost. I paid £2 for a pack of 3 which I thought was extortionate to be honest but I think they might just be worth it. 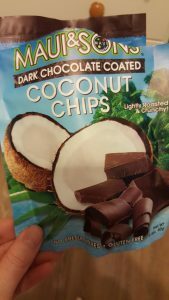 They aren’t replacing all the bad stuff in my diet though, let’s be clear on that – I polished off quite a lot of those dark chocolate covered coconut flakes about an hour ago because I NEEDED sugar. Anyway, this post isn’t meant to be about peaches or sugar, it’s meant to be about Veganuary! I know, I know, I’m starting to post about something that took place in January, in February. But that’s just how I’m rolling this damn fine 2017. So basically Veganuary is one of those one month challenges – you commit to follow a vegan diet for the month of January. At the end of last year I was looking for a challenge. The half marathon apparently wasn’t enough, I needed something else. My personal reasons for taking on Veganuary had nothing really to do with animals wellbeing or even to do with my health, though obviously both of these were underlying factors in my decision (I undertook a vegetarian diet last year for a month because the whole eating animals thing has never sat that well with me but I felt unhealthy in the end because my diet ended up being so carb-heavy and cheese-laden at every meal). For me my deciding factor wasn’t either of these. I mentioned in an Instagram post (if you don’t follow me you should, I post lots of food pictures… they are all taken with my Samsung S6 camera which I don’t care what any review tells you, is a godawful camera which refuses to focus on anything 90% of the time) that I struggle with January. For me it’s filled with feeling fat, feeling ugly, feeling unmotivated, stress that I’ve left my tax return to the last minute and stress that I don’t really earn much money in January and I spent a small fortune in December. I find it easy to end up in a slump where I don’t want to get out of bed, I can’t be bothered with anything and I don’t wash my hair for days on end. Honestly, these slumps can happen any month but January everyone’s reinforcing the fact it’s a miserable month with Blue Monday and all that stuff and I feel like I absorb it more if that makes any sense. So in a grand effort to not let this happen I wanted a challenge and I just happened to see the Veganuary advert at the right time. So I signed up and a month of totally animal free diet was up ahead of me. I wasn’t nervous or really concerned about it really – I was really looking forward to having a new focus in the kitchen. I love cooking and trying new things and sometimes you can end up cooking the same few recipes with little need to veer off your comfortable path. My one worry was cheese. I’ve probably mentioned before that I LOVE CHEESE. All cheese. Cheddar, stilton, Wensleydale with cranberries, a spot of Philadelphia on a bagel, smoked cheese. I’m that girl at the Italian restaurant that gives the waiter arm ache when he asks if I’d like parmasan on my pasta… I’ll let you into a secret – partway through the month I started to develop an addiction to vegan cheese which didn’t feel too healthy as I’m pretty sure it’s processed crap so I’ve stopped letting myself buy it now. Day 1 was of course New Year’s Day so I started the month off with a bit of a hangover and in the knowledge that I’d invited my family and Rich’s family over for New Year’s Day dinner. What had I done?! I’d downgraded from a full roast to sausage and mash but this still proved slightly trickier than I’d anticipated. 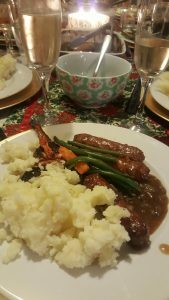 My sister and brother-in-law are vegetarian so I used the same Linda McCartney sausages for the 3 of us and a variety of meat sausages for the rest. The issue came when I realised I couldn’t have mashed potato the way I wanted it! I still cooked it with milk and butter because I know it’s delicious that way and I’m serving guests… but because of a lack of pre-planning (I can only blame myself, I know) I had to portion myself a bit of dry mash before I created their delicious creamy stuff. On the plus side my carrots were delicious (I roast them with olive oil, salt, pepper and thyme and they are so sweet and lovely, they are one of my favourites). Then came dessert. I’d planned to somehow create a vegan apple crumble but the hangover and stress took over and I just made a ‘normal’ apple crumble which I couldn’t eat. Which was fine but they said it was a lovely crumble, one of the best they’d had blah blah and I don’t even know if they were lying! For myself, I stewed some apples with a bit of sugar and some raisins and had that. And it was ok, you know. I’d survived day 1, with a hangover and without preparing properly. I kind of felt if I could do that the rest of the month would be ok.
Loads of demerara sugar to finish! Peel the apples and cut them, discarding the core. Then chop them into small-ish pieces and mix in a bowl with the 3tbsp golden caster sugar. Mix the flour and sugar together in a separate bowl and then cut the butter into this mixture. I then chucked it all into a food processer and put it on til it looked a bit like breadcrumbs and there are no chunks of butter left. Top the apples with the crumble! Then sprinkle the top with as much demerara as your heart desires. I suggest a decent amount because it creates a brilliant sweet crunchy topping. I LOVE demerara for that. Then chuck it in the oven – I cook practically everything on 160 fan, for about 30 mins or until the top is golden and you can see the apples starting to bubble up the sides to escape! I’ll put it on my to-do list to create a vegan version in the future. I have loads more Veganuary related posts to come, and of course some long overdue running updates too, so keep your eyes and ears peeled over the next few weeks – this site isn’t going to know what has hit it!